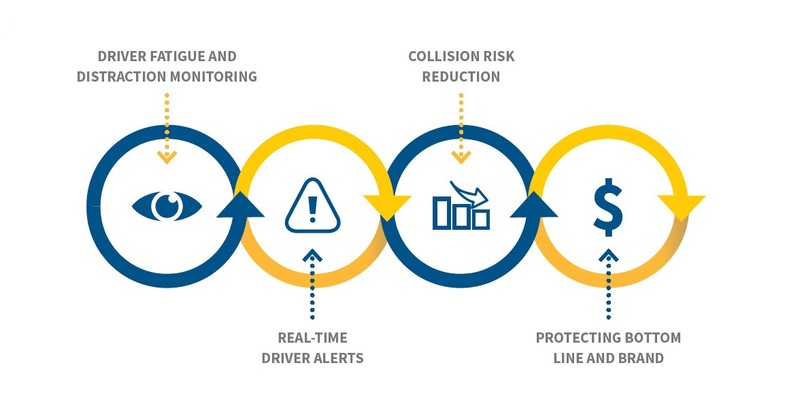 Fatigue and distracted driving monitoring solution with an audible alarm that increases in volume and frequency to force a driver to take note of his dangerous fatigue level and stop the vehicle before a possible collision or to redirect his attention from any distraction. The ability of a driver to self-assess his fatigue level diminishes as he grows more tired. A vast number of accidents are the direct result of fatigue and driver distraction, placing a burden on the transport industry, already under strain of a challenged economy. DriveAlert is linked to DriveCam online – now it not only warns the driver, but also generates a video clip for the fleet owner to assess the occurrence – whether cell phone use, sleep apnoea or other driver distractions. Linked to our Early Warning service, real time alerts via SMS or telephone, (severity dependent) will timeously warn the fleet owner enabling preventative intervention. DriveAlert recognises fatigue and distracted driving by monitoring a driver’s retinas and face. Using the PERCLOS measure of alertness, it detects fatigue even before the driver closes his eyes. The unit looks like a camera, but incorporates a high-end infrared camera, microprocessor, memory modules and alarm system. DriveAlert is and early warning system that actively tracks the drivers eyes & facial features to detect fatigue or distracted driving. When detecting these signs an audio alarm will sound to alert the driver of their fatigued state. If they continue to drive & show signs of fatigue the system will continue to alarm in a high pitched tone followed by voice alerts. 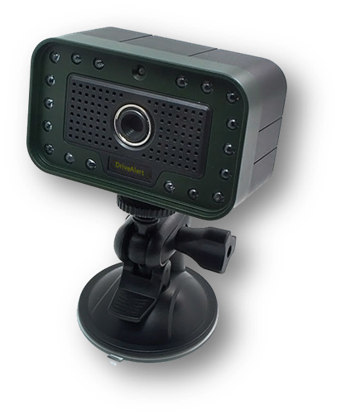 The unit looks like a camera, however incorporates a high-end infrared camera, microprocessor, memory modules & alarm system. Fatigue and distracted driving monitoring 24/7 in all weather, light, conditions, including if driver is wearing sunglasses. DriveAlert recognises fatigue and distracted driving by monitoring a driver’s retinas and face. By incorporating the PERCLOS system (Percentage of Eye Closure), fatigue is detected even before the driver closes his eyes. A high pitched alarm followed by voice alerts used to make the driver take note of fatigue levels or distraction. On each start-up of the vehicle the DriveAlert monitor will scan the drivers eyes and facial features in order to recognise any future changes related to fatigue or distraction. Drive Alert can also activate DriveCam and send video footage of fatigue and distracted driving incidents. The unit will be installed into a tamper proof case and then mounted in position to avoid tampering, setting adjustment and power disconnection etc.